We pass laws forcing people to install restricted flow shower heads. The hotel responds by installing a double shower head and posts a sign saying “restore our world” by turning off one of the heads to save water, our “precious resource.” We use time and money — precious resources — to pass the laws; we use capital — a precious resource — to install double shower heads that deliver more water; and we print signs — using precious resources — to restore our world without asking the obvious question: Restore to what? And all of this is to save water which falls from the heavens, runs into lakes and streams, is diverted into pipes delivering water to the shower heads, cleans our bodies, runs down the drain, and returns to the watershed. To be sure, the shower heads, the water purification systems, the delivery systems, and so on use precious resource which might be saved, but how can we save water? See the Green Tea Party pocket guide [pdf] for some market-based solutions to water allocation. The May issue of Outdoor Life carried an article entitled “Can I Fish This Stream?” It included a map of the U.S. showing 45 states with “limited stream access,” 4 with “pending access litigation,” and 1 with “liberal stream access.” The one was Montana, about which the article’s author opined, “Anglers in other states should be so fortunate.” Not so fast. 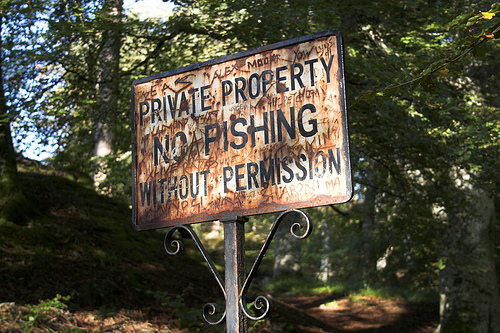 Since the original stream access cases in the early 1980s, landowners have claimed that the court and the legislature took property rights without compensation. Not surprisingly, the conflict has torn the social fabric of landowner-sportsman relations in Montana. What the author failed to note was the unintended consequences of Montana’s law, namely landowners who cannot prevent access have less incentive to preserve habitat. The now infamous Mitchell Slough case in southwest Montana illustrates what can happen. When anglers took the right to control access from landowners and created public access to the reclaimed irrigation ditch paid for by landowner dollars, owners rightfully shut off the flow leaving fish high and dry. Not only did this reduce spawning habitat for trout that previously migrated freely into the Bitterroot River over which public access has never been questioned, it reduced the incentive of other landowners to invest in such reclamation projects. The Outdoor Life article concludes that “although Montanans were able to ward off impingement of their access rights last fall, it’s not likely that the assaults on stream and river accessibility are over.” Proponents of unlimited access fail to recognize that their assault on landowner rights is also an assault on trout habitat. Access unlimited, yes; trout unlimited, no. When PERC opened its doors in 1980, free market environmentalism (FME) was considered an oxymoron; environmentalists saw markets as an enemy, not an ally. Now, thanks to PERC, the largest and oldest think-tank focusing on market solutions to environmental problems, FME is being tried and tested around the world. In Africa, private land owners are protecting rhinos from poaching; in the Caribbean an alumnus of PERC’s Enviropreneur Institute (PEI) is working to help replant and regenerate dying coral reefs; and in the Gulf of Mexico, the Environmental Defense Fund has joined PERC in campaigning for property rights solutions to overfishing. At 45°N and 4,820 feet elevation, PERC needs your help to keep its dedicated PERC staff warm this winter season! 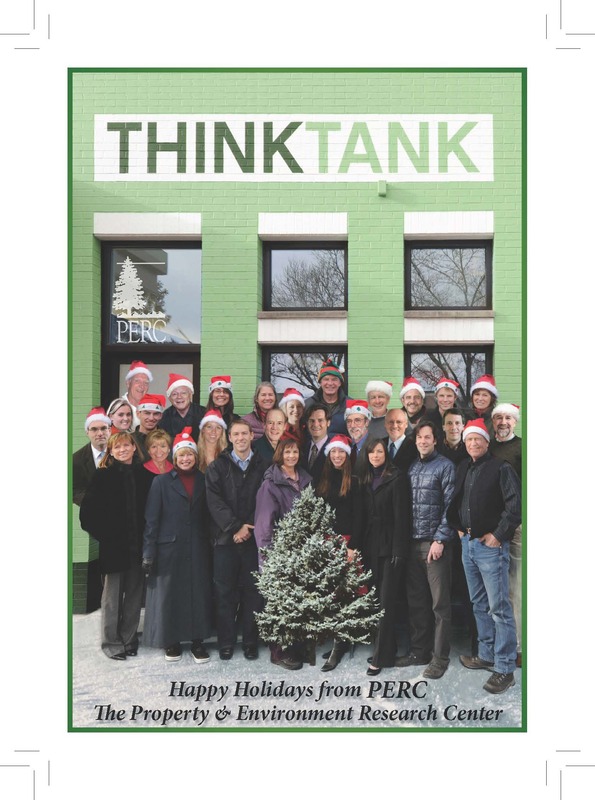 Your tax-deductible gift will help fund innovative research, convene conferences, publish the results in PERC Reports and other venues, and add to the growing number of environmentalists implementing PERC’s ideas. $15,000 will give an environmental entrepreneur an opportunity to attend PEI and learn to apply FME to their work. I assure you that your tax-deductible contribution will promote environmental quality with less government and more individual freedom. Now is the moment when improving the environment by utilizing property rights and markets rather than big government can truly benefit America as the nation works to deal with its fiscal crisis. On Sept. 29, European parliamentarians adopted a resolution calling for next June’s United Nations Conference on Sustainable Development in Rio de Janeiro to demand that all nations adhere to the “principle of non-regression.” In a nutshell, the claim is that international law forbids nations to amend or repeal laws designed to protect the environment. . . . There’s no mystery why the principle of non-regression is so appealing to many environmentalists. It would exempt existing environmental regulations from review, reform and repeal, even if the costs have proven to be greater than the benefits. The mystery is why the parliament of an economically struggling continent would agree. U.S. environmentalists also insist on policies with huge economic costs without environmental benefits as evidenced by the efforts to stop the Keystone pipeline. Must we follow Europe’s failed economic policies and its environmental nonsense, too? If the scholarly papers presented at the workshop didn’t provide enough evidence of this link, Don Leal and I saw it first hand when we hunted pheasants on the Crow Reservation last weekend. Like most western reservations, the Crow has three categories of land ownership: tribal lands held in trust by the U.S. Government; individual Indian lands also held in trust; and privately owned lands. The important thing to note is that the trust lands are shrouded in layer upon layer of bureaucratic red tape. It was this bureaucracy that led to a court decision (Cobell v. Salazar) holding that the federal government pay $3.4 billion to individual Indian for violation of its fiduciary trust responsibility. How would you like the federal government to be trustee of your assets? Moreover, trusteeship makes it impossible for tribes or individual owners to use land as collateral for loans, one of the main sources for agricultural investment. Not surprisingly, trust lands have little investment and little agricultural productivity. Under tribal rules, Don and I could only hunt on trust lands so we took along an ownership map. Turns out the map was not necessary; we could easily tell the trust land from the private land. With only a fence running between the two, the private lands had crops, grain storage bins, barns, and so on; the trust lands had only a few cows or horses grazing on them. PERC’s research shows that property rights are key to good resource stewardship and economic development is key to understanding why American Indians remain at the bottom of the income ladder. Stay tuned to PERC for more research on this subject. I purchased The Darwin Economy: Liberty, Competition, and the Common Good by Robert Frank thinking I would learn something. I did. I learned that I should not have purchased it. Frank takes a very simple game theory used to explain the arms race (and naively applies it to elk antlers, arguing that one elk grows big antlers and gets all the cows so that others must also grow such big ones to compete), applies it to market competition, and concludes that competition can lead to bad things for the group as a whole. In the case of elk, he claims that large elk antlers make elk as a species worse off because the antlers make it difficult for the bull elk to run through the woods and therefore more susceptible to wolf predation; obviously he has never seen a bull lay his head back so that the antlers are tucked neatly against his back and ribs and run through the thickest trees; never seen a bull use the antlers for defense against wolves; and doesn’t ask how it is that elk are thriving by moving to more open spaces in the presence of wolves–spaces which they occupied before human pressure moved them to the mountains. Finally, Frank argues that taxes can fix the problems–and yes, of course, most importantly the problem of global warming. No data, no theory, no knowledge of wild species, but lots of rhetorical arguments. Save your money, and if you get a complimentary copy, save your time by not reading it. With the battle over the debt heating up in Congress, the EPA has once again become the target of budget cutters in Washington. A plan by House Republicans to reduce funding for the agency has been called an “environmental disaster” and a “declaration of war” on environmental protections. But the question no one is asking is what effect the EPA’s budget has on measured environmental quality. Do increased EPA budgets result in direct improvements in environment quality, or does it simply increase the size and scope of the agency? Could budget cutting reduce bureaucracy without reducing environmental quality? 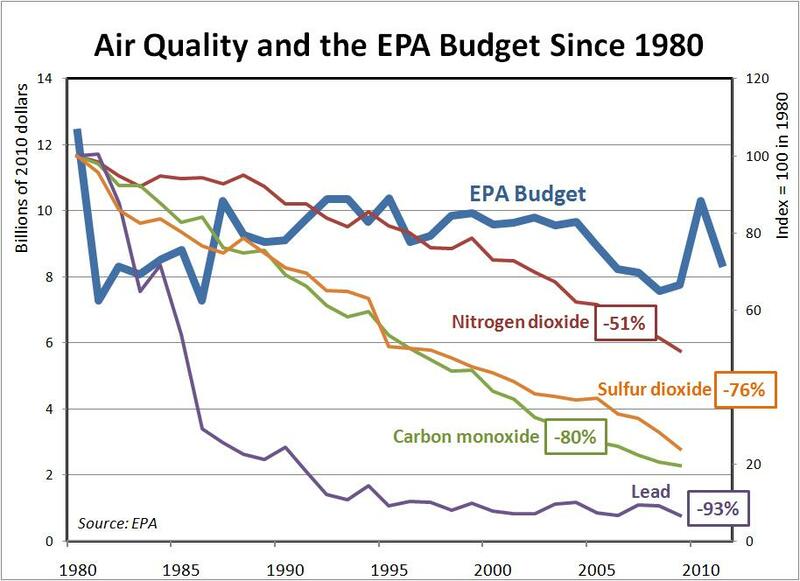 Consider the figure above, which shows that since 1980, the EPA’s budget (adjusted for inflation) has remained relatively flat, yet air quality continually improved. Ambient concentrations of nitrogen dioxide have declined by 51%, sulfur dioxide by 76%, carbon monoxide by 80%, and lead by 93% (data here). Moreover, as Joel Schwartz described in PERC Reports, fine particulate levels have declined by 42% and peak ozone levels have fallen 30% as well. Such data suggest that increasing the EPA’s budget, as the Obama administration has proposed, will only increase bureaucracy, not air quality. Since the EPA sets national air quality standards, the agency decides when its own job is finished. Despite such improvements, the EPA has never declared the air safe and continues to push for more funding, more workers, and more regulations. If lawmakers are looking for an agency in which to cut spending without causing harm to the environment, the EPA is a great place to start. This post was co-authored with Shawn Regan. [T]he elected government of Harvard-trained President Ellen Johnson Sirleaf has signed a deal with the European Union to place timber sales on a permanently legal footing. The deal, agreed to this month, makes use of a unique national timber-tracking system that requires every legally harvestable tree and every cut log to carry a barcode that will enable it to be tracked from its origin to its final destination. …Every tree in a forest with a logging concession must be tagged with a unique barcode. When that tree is cut, the action is recorded and new tags are attached to each log. Every log that turns up at a port has to be traceable back to a stump in a forest. It’s as simple and as foolproof as checking out at the supermarket, says Ivan Muir, the local boss of SGS, the Swiss specialists in forest certification systems who are in charge of making it happen. Muir also issues export permits for the timber — which mostly gets turned into furniture and paneling — and monitors royalty payments to the government. Last week I joined Andy Nash on InsideAcademia.tv for a short discussion on “Sustainability and Free Market Environmentalism.” The video is now available online. Thanks to Andy for a great discussion. Today, the great economist and Nobel laureate Ronald Coase will celebrate his 100th birthday. Coase’s work has revolutionized the way economists view resource conflicts. His paper “The Problem of Social Cost” challenged the widely-accepted work of Arthur C. Pigou on externalities and inspired a whole new way of thinking about environmental issues. For several years, I have been on a campaign to expunge the term “externality” from the vocabulary of economists, policy makers, and environmentalists. My campaign is not motivated by a belief that markets perfectly account for all costs and benefits. Rather it is driven by the lessons learned from entrepreneurs—the people with a passion for solving problems by finding win-win solutions. Entrepreneurs thrive in the space where there are impacts not accounted for in market transactions. It is in that space that they create gains from trade. Consider the example of irrigation water withdrawals reducing stream flows for fish habitat. Viewed through the externality lens, trout fishers might argue that farmers are imposing costs on them and that the government should regulate water use. An environmental entrepreneur, however, sees an opportunity to convince trout lovers to contribute to the cause and to contract with farmers to increase instream flows. Or consider the desire for open space. Through the externality lens, demanders of open space might say developers are imposing costs on them by building houses and that land use regulations are necessary. Land trust “enviropreneurs,” on the other hand, accept the landowner’s right to develop and obtain conservation easements to determine future land use. There is a big difference between the externality approach and the entrepreneurial approach to improving environmental quality. Asserting the existence of an externality pits one user of a resource against another in a zero-sum game where property rights are not clear. California’s Mono Lake is a quintessential example. In the early 1980s, environmentalists filed suit to stop Los Angeles from diverting water out of the Owens Valley even though the city had purchased the water by buying farmland and its accompanying water rights. The environmentalists “won” the suit, but it was not until the late 1990s when the legal wrangling ended and some water started flowing back into Mono Lake. In contrast, entrepreneurship encourages conflict resolution and results in positive outcomes for all parties involved. Chris Corbin, a PERC enviropreneur fellow, epitomizes entrepreneurship. His firm, Lotic LLC, increases cash flows by encouraging efficient water use, by protecting and maximizing the value of water rights, and by developing water projects with ecological benefits. Rather than promoting conflict like that in the Mono Lake case, Corbin utilizes cooperation to keep more water in streams. 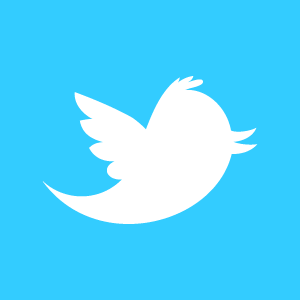 A Coasean view of the environment focuses on who owns the environment. When property rights are well defined and enforced, markets can work their magic. When property rights are not so clear, environmental entrepreneurs who clarify them do good for the environment while doing well for themselves. In honor of Coase’s 100th birthday, let’sreplace externalities with entrepreneurship. The more we do so, the more we will see conflict replaced with cooperation and environmental rhetoric replaced with environmental improvement. It would appear that Santa arrived early this year in the form of a Swiss billionaire who donated $35 million to the Nature Conservancy and the Trust for Public Land. The donation was used to help the organizations purchase 310,000 acres in Montana from Plum Creek Timber. The kicker is that the land will be turned over to the federal government. This may seem like a gift from Santa, but beware of the warning label: this gift requires significant maintenance costs. Unlike most assets, which are expected to earn returns over the long run, turning this land over to the federal government will generate costs, not revenues. The Forest Service – the agency poised to receive the lands – loses an average of 77 cents for every dollar it spends on land management. And based on the average amount it costs the Forest Service to administer an acre of land, the Plum Creek parcels will cost the government approximately $6 million per year. That means that in six years, taxpayers will have spent more on management than the Swiss Santa donated in the first place! This is hardly the kind of gift that a government so far in debt needs.